Last Saturday I went on a blind date, something I hadn’t done since college when my date Mike brought along his dog Bandit and he kept trying to lick my face, which really grossed me out because he did it in front of Bandit. Fortunately, Mike moved on and I went on to marry a wonderful man who didn’t bring his dog on our dates, until after we got engaged . . . 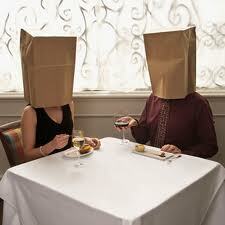 So why would an aptly harried, I mean, happily married woman go out with a man on a blind date? The answer is: E. There is no E, you say? That’s because it’s a trick question. My date was not with a man, but with a woman. A woman I met online. A woman who uses an alias. A woman who calls herself Paprika Furstenburg. Sound like a Jewish spice you’d want to sprinkle on your knish? Well, Paprika is actually a writer of the blog, Good Humored, a funny perspective on everyday experiences. I “met” her last fall when we began reading each other’s blogs and exchanging comments. It was a give and take arrangement based on mutual respect, trust, and support, much like a marriage, only we didn’t fight over money. Over time our relationship blossomed into a friendship. I use the term friendship loosely because unlike my other friends, I had never seen her mug shot and couldn’t pull her out of a lineup if my life depended on it. I enjoyed the mystique of not knowing who Paprika was or what she looked like. Living in an information age with social media tools like Facebook that make every last detail about our lives public down to our last bikini wax, I found her anonymity refreshing. Yet at the same time, part of me yearned to meet her. Opportunity knocked when my friend Ronnie from Morristown Memos (“True stories with a twist”), who had also befriended Paprika online, invited Paprika and me to lunch. Although I felt conflicted about ending the mystery, I couldn’t resist the chance to meet the illustrious spice girl. We decided to meet at a restaurant equidistant from our respective homes. “You’re meeting a stranger for lunch?” asked my thirteen- year-old son as I was walking out the door. He was right to be concerned when, without knowing Paprika’s real name, I had been unable to do a background check as I do with my other friends . . . I felt slightly nervous, and wondered: What would she look like? What would she sound like? Should I bring mace? I was comforted by the fact that we shared some important things in common: she lived in New Jersey, she was Jewish, and she blogged. I didn’t even share those things in common with my husband when I first dated him. Ronnie and I arrived at the restaurant promptly at noon, and immediately spotted the redheaded Paprika waiving at us in the empty lobby. I was a little disappointed that she wasn’t holding a balloon, a short person trick she said she sometimes used in these situations. She had no problem recognizing me since more of my headshots adorn my blog than presidential portraits adorn the White House walls. Relief washed over us when we realized we were all unarmed. We greeted each other with hugs, and once seated, talked nonstop for two hours. The conversation wasn’t peppered with punch lines as you might expect of humor writers, but only because we were too busy digging into each other’s personal lives—and personal pizzas. Paprika seemed as genuine and trustworthy as she does on her blog, which explains why she didn’t even flinch when Ronnie and I both got up to use the restroom when the bill came. “How old is she?” my son asked. “Around my age,” I answered. “So she’s old, “ he said. My family could joke all they wanted, I was just happy that I had finally crossed the line of virtual friendship with Paprika into reality . . . and that she didn’t once try to lick my face. What a riot!!!!! Destiny wins again…..
A meeting of the minds. Love it. If I didn’t live in Florida, I’d love to have joined you two. I enjoy both your blogs immensely. We’d be there with bells on! 🙂 That might be noisy, but the company would be enjoyable. Well said! Destiny did win! Wow – I hate to think what the background check turned up on me, when we had coffee! When I lived in NYC, my roomie was named Cinnamon. (Seriously) Those spicy friends are such savory treasures. Great post, Lisa! It was such fun to get together with you and Ronnie. I’m glad I didn’t disappoint you and ruin the mystique I inadvertently created with my spicy alias. Rest assured that I won’t lick your face at any point during our friendship. Thanks, glad you enjoyed it! And I guess we’ll have to keep trying to prove our kids wrong . . .
For a minute there I thought you were leading up to a seeing eye dog story. You crossed the virtual and physical world and everything is still intact?! My brain has a few short circuits but they were there before my rendezvous . . .
It’s good to know all is right in the world! How fun! I noticed your name on the Erma Bombeck Writer’s Workshop list. I’m going too. I’m up for sloppy seconds if you are game for another blind date. Why do I feel like I’m on Match.com. “sloppy seconds” LOL! 🙂 I am absolutely game! I’d very much like to meet you in person. Can you email me or reach out on Facebook or twitter and give me your contact info? My sister and I will be in Dayton to see Carrie Fischer that week. We’re not attending the conference this year (we both have before), but we are staying at the same hotel. Would love to meet up with both of you, if we can figure out the details! We can double-blind date! I always evaluate dates by the amount of face-licking that occurs. Don’t read into that statement. Brilliant post! Good to hear neither you or Paprika tried to abduct one another : ) I loved reading both your perspective on the date and Parika’s too. Very well written and humorous! *Paprika …gosh I hate spelling mistakes! Thanks for your delightful comment! That’s great!I met one of my blogging buddies from California when she accompanied her husband on a trip to England. It was the best – like catching up with an old friend. You’ve just inspired me to make my next blind blog date international! Absolutely, blogs are also a great way to form unique friendships.